The Legend of the Wendigo is a cute all vs one game from Masked Scorpion. I’ve played a number of Christian Lemay’s games, and many of them are whimsical and fun for families. This one is no exception. As the story goes, there is a campout of Chipmunk Scouts and the dreaded Wendigo is attacking the camp, stealing a scout from the camp each night. OK, so most family games don’t revolve around the abduction of small kids – but hey – it’s a game! In the set up, one player is chosen to be the Wendigo player. The others form a team playing against him (and sit on the other side of the table as the Wendigo). 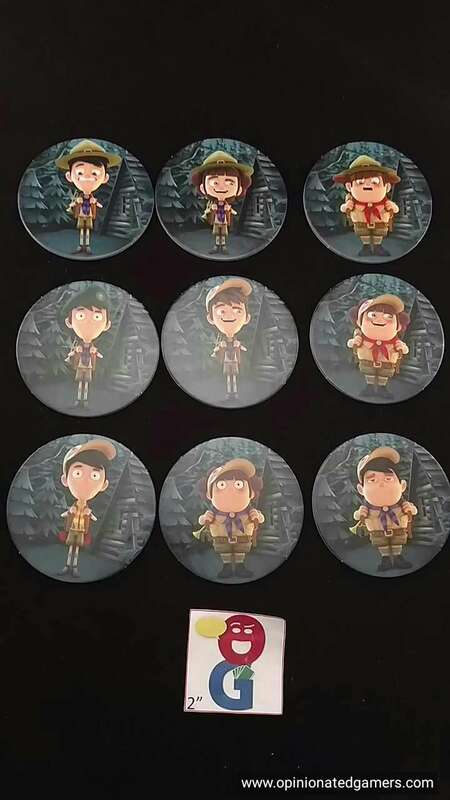 There are 32 round Scout tiles. These are splayed on the table so that all can be easily seen and so that none are lying on top of any others. 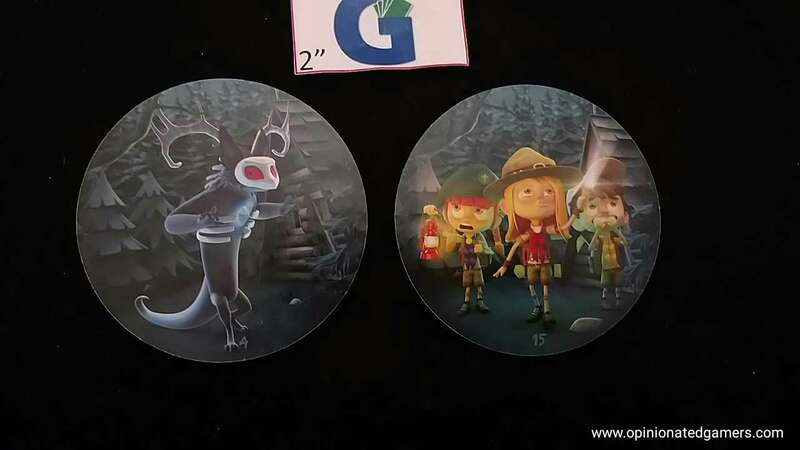 The Wendigo player gets his own set of tiles, each with a scout pictured on it. The Wendigo player shuffles them and chooses one at random. He then looks at the tableau to find the matching Scout tile on the table. The other team turns around and closes their eyes. The Wendigo player then replaces the Scout tile with the matching Wendigo tile (the backs of the tiles are numbered so that the Wendigo player can make sure he has the right tile). Then, the scouts turn back around and open their eyes. The sand timer is flipped over (about a minute), and the Scouts have to memorize as much about the Scout tiles as they can in that time. When the timer runs out, the Scouts again turn around and close their eyes. The Wendigo player then moves into the Night Phase. He removes any Scout tile from the table and then moves the Wendigo tile into the space just vacated. Thus, there will be an empty space on the tableau and it will be the space where the Wendigo tile used to be. Then the players move into the Day Phase. The sand timer is upended, and in this time limit, the players discuss which tile they think is the Wendigo tile. Whenever they have agreed, they flip over the chosen tile. If they see the Wendigo on the back side – they win! If not, the flipped tile is placed back on the table and then the players have the rest of the timer to examine the tableau for the next round. If the game is still going on, there is another Night Phase – and another Scout tile is removed… The Wendigo player will win if he is able to remove five Scout tiles from the table without the Scout players choosing his tile. 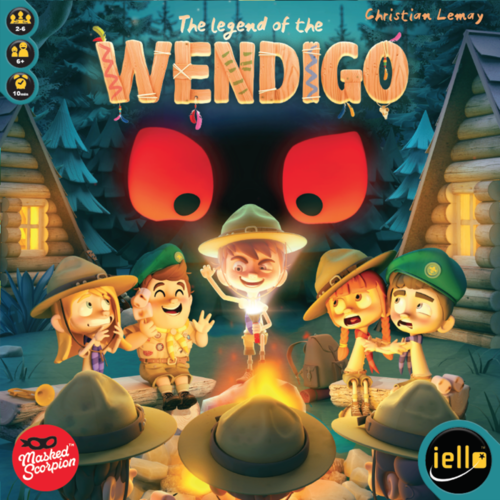 The Legend of the Wendigo is a deceptively difficult pattern recognition game. At first glance, when I read the rules, I thought that every game would end in about two rounds because SURELY I’d be able to see which camper had moved in the night. In reality, the game is fairly difficult. The little buggers (well, some of them are pretty fat) all look alike, and their hats, scarves and trumpets all kinda blend together – which is exactly the plan of the designer. When you only have 45 seconds to concentrate on the board, you can’t possibly remember all the details. And then on every night after the first, you use much of the 45 seconds trying to figure out who the Wendigo is – and if you fail, you only have the remaining time to try to remember! This game gets much easier as you add more people to the game. In a head-to-head game, this seems nearly impossible for the campers to win. There just isn’t a great way to process and remember all the information on your own. In larger groups, you can split up the campers into smaller, easier-to-remember areas, and the Wendigo is almost always caught in a round or two when you have 4 to 5 people watching very small areas. The game’s sweetspot for our group seems to be three players – in all other situations, the Wendigo has been captured quickly. This is well suited for young kids – who not only excel at memory games in general but who will also not tire of a one-trick gaming pony. The game is well produced with nice artwork on thick tiles, but in the end, it’s a memory game. There is a sheet of variant games which can be played with the tiles available on the IELLO website. We have only tried one of them which was a speed based variant. We passed on the version which was a simpler version of Memory – as the tiles do not have identical backs.